The uniform we have adopted is smart, inexpensive and hard wearing. The school colours are electric/royal blue, grey/black and white. PLEASE MARK ALL CLOTHING AND FOOTWEAR WITH YOUR CHILD'S NAME- Thank you! Grey/black skirt, trousers (not skinny jeans) or shorts, skorts or pinafore Grey trousers or shorts (not skinny jeans) or shorts – jogging bottoms are not acceptable. Uniform can be purchased from supermarkets but the following items have our school logo on and are available from Skoolkit: sweatshirts, cardigans, T.shirts, Polo shirts and P.E. bags. These are examples of the t-shirts children wear for PE. They are available from the school office for £2.00. Similar items are easily available from Marks and Spencer etc. in town. Shoes must be black (without colour or stripes), and sensible. For health and safety reasons we do not allow children to wear shoes with platform soles or high heels. High heels, open toes, slingbacks, platforms and trainers are not acceptable. Boots higher than the ankle are also not acceptable. UGG style boots or moon boots are also not acceptable. When shoes worn are not in line with this policy, the child will be given plimsolls to wear that day. Children are only permitted to wear one pair of stud earrings. This means that hoop and dangling type earrings should be kept for out of school hours. Jewellery can get lost or damaged, resulting in distress and upset to the owner and interfering with learning. Pupils may not wear earrings whilst doing P.E. because they may cause injury to themselves and others. It would be helpful if children did not wear earrings on days they have P.E. lessons. They should be able to take out and replace their earrings unaided. If children cannot remove their own earrings parents must provide tape to cover them. Please note: Teachers are not permitted to remove earrings. If you are considering allowing your child to have their ears pierced this should be done at the beginning of the summer holidays. This enables the ear to heal and for the earrings to be removable and replaceable by the start of the new term. We would prefer it if children did not wear watches to school, but if they do they should be clearly marked with the owner’s name. The school regrets that it cannot accept any responsibility for the safekeeping or loss or damage to watches, earrings and other personal property. Children are not allowed to wear nail polish. This needs to be saved for weekends. Hair should be sensible and tidy, and without shaven ‘streaks’ or decoration. This includes dying hair, which is not permitted. Outdoor: Plain black or grey tracksuit bottoms and jumper (no large logos). 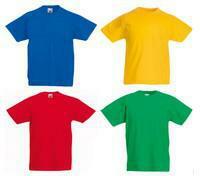 Plain coloured t-shirt (available from the office for around £2.00 each). Trainers (black/white preferably). Please note: Tights are not to be worn for PE. These items should be available in school every day of the week. All Year 4 children need a swim-suit and a towel at certain times in the year. Children may also wish to have football boots, football shirt (royal blue) and football socks (royal blue). Trainers are ideal for playground games/P.E. lessons and can be used on the field if it is not too wet. All items of school clothing should be clearly marked with your child’s name and kept in a bag, also named. Children may do indoor P.E. in bare feet or plimsolls ( not trainers, which are unsafe on P.E. apparatus). A note from home is needed if any child is to be excused from P.E. lessons. PLEASE MARK ALL CLOTHING AND FOOTWEAR WITH YOUR CHILD’S NAME- Thank you!